Have you ever gone to take your clothes out of your washing machine, only to find them dripping wet? Or maybe you've opened the door to your machine to find the interior covered in mold and mildew. These issues can put quite the damper on a perfectly good day, as they usually mean you need to come up with extra time and money to get these problems taken care of and your laundry looking and smelling fresh again. Once mold begins to form inside your washing machine, it can give off an unpleasant, musty smell that may even transfer to your clothing. When you aren't using your washer, leave the door open. This will improve air circulation throughout your machine and allow the door and drum to dry out before you put the next set of clothing in. Wipe down the rubber seal surrounding your door after each wash with a dry cloth or towel, as this is where a lot of the mold forms. Also, remove clothes as soon as possible once the cycle is complete, as leaving wet apparel in the machine for too long is one of the most common causes of mold buildup. Remove your clothes from the washer as soon as the cycle ends. It's a good idea to clean out your drain filter once every few weeks to prevent problems from arising with your system's drainage. This is usually the issue when your clothes are still soaking wet after the final spin cycle or there are unusual pauses during the wash cycle. Over time, the filter can get clogged with debris like fabric and hair, causing water to drain more slowly and less effectively than it should. Most of the time, the drain filter can be found at the bottom front of the machine. However, its location may be different depending on the machine, so check your washer's manual. 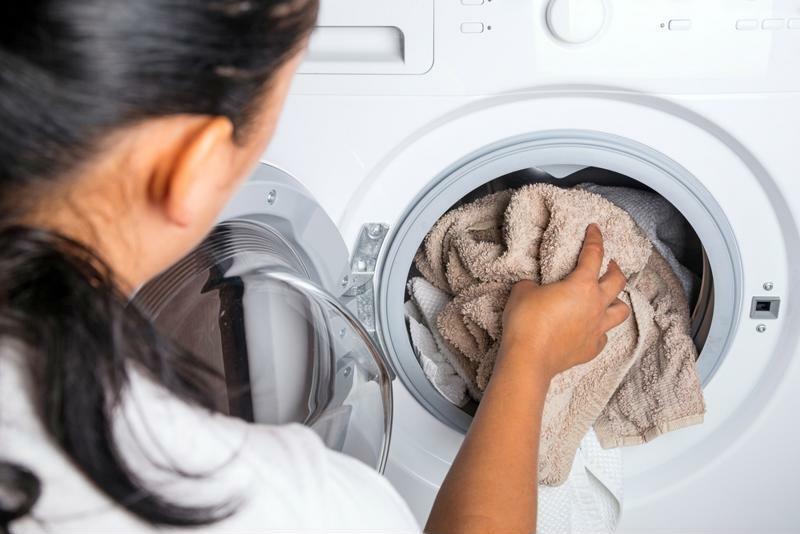 Every month or so, give your washer a thorough cleaning with a touch of distilled white vinegar and one cup of baking soda. Place the vinegar into the detergent dispenser and drop the baking soda into the drum to neutralize the pH and scrub the machine. Then, activate the hottest cycle and an extra rinse. If you've notice that your system is covered in quite a bit of mold, use bleach instead of vinegar and run a few cycles with hot water to eliminate especially tough mold and mildew. Even if you took the time to ensure your washer was on level grounds when you set it up, it can move over time. If your machine ends up on an uneven surface, it won't function properly, as it will try to recalibrate. Check it regularly to ensure that it's steady and on firm footing. The spin speed that you select for your cycles should coordinate with the amount of clothes you have in the washer. Higher spin speeds may produce dryer clothing, but they aren't always recommended, even for cycles with large amounts of attire, because they can end up causing a lot of wear and tear to your machine over time. If your washing machine begins to break down from frequent use, you'll be happy you have your home warranty from TotalProtect to request a qualified technician to take care of the problem at hand. Investing in a home warranty is one of the easiest, most affordable ways to avoid the high standard maintenance fees that often come with requesting a repairman to fix home system breakdowns.